Kate Wood protests impending demolition of a nearly century-old synagogue on W. 93rd Street. As a 93 year-old UWS synagogue is threatened with demolition, LW! President Kate Wood urges preservation over condo development. 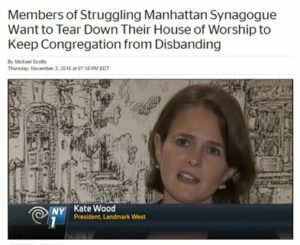 Watch Kate’s NY1 interview and read more about community opposition to Congregation Shaare Zedek’s demolition plans for its 1923 building.